^ 1.0 1.1 Zainal Abidin Shaikh Awab and Nigel Sutton. 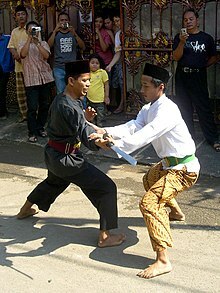 Silat Tua: The Malay Dance Of Life. Kuala Lumpur: Azlan Ghanie Sdn Bhd. 2006. ISBN 978-983-42328-0-1. ^ 2.0 2.1 Sheikh Shamsuddin. The Malay Art Of Self-defense: Silat Seni Gayong. North Atlantic Books. 2005. ISBN 1-55643-562-2. ^ Donn F. Draeger. Weapons and fighting arts of Indonesia. Rutland, Vt. : Charles E. Tuttle Co. 1992. ISBN 978-0-8048-1716-5. This page is based on the Wikipedia article 马来武术; it is used under the Creative Commons Attribution-ShareAlike 3.0 Unported License (CC-BY-SA). You may redistribute it, verbatim or modified, providing that you comply with the terms of the CC-BY-SA.